Media advisory - Aga Khan to launch new institutions in Toronto, Canada - 20100-05-26 | Ismaili.NET - Heritage F.I.E.L.D. Situated on a 6.8 hectare site along a major artery of Toronto, the Don Valley Parkway, the buildings and park represent the Aga Khan's commitment to Canada and appreciation for the country's adherence to pluralism and cultural diversity. 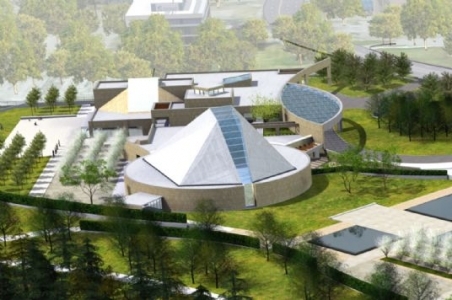 Designed by renowned architect Charles Correa, the Ismaili Centre, Toronto will be the newest addition to a network of Ismaili Centres worldwide, and will be the second in Canada after the Ismaili Centre, Burnaby which opened in 1985. The Centres are representational buildings for the Ismaili Muslim community, and will include a place of prayer, library and spaces for cultural activities. The Centre will host an active series of programming to engage a variety of stakeholders in dialogue, learning, and bridge-building. This is Correa's first commission in Canada. The two projects will be united by a new landscaped park, designed by Lebanese landscape architect, Vladimir Djurovic. The park will incorporate the Islamic "chaar bhag" or formal garden, and will include reflecting pools, walkways, and four-season components suited to the climate of Toronto. The Park will be open to the public and is intended to be a place of tranquility and contemplation. Media are required to register for this event in advance at Jennifer@akfc.ca . Media accredited with the Canadian Parliamentary Press Gallery will have access to the event. Non-gallery members must send a letter of assignment to Jennifer@akfc.ca. As space is limited, we apologize in advance for not being able to accommodate all requests. no later than 12:30 pm.